Status Alert tag holders allow you to enclose safety tags. We offer a wide selection of Status Alert Tags to control and alert of potentially hazardous situations using our changeable tag holder system. 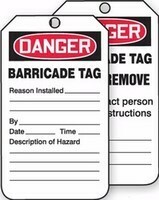 We offer Scaffold Status Tags, Forklift Status Tags, Confined Space Status Tags, Hot Work Status Tags, Cylinder Status Tags, Ladder Status Tags and Barricade Status Tags to choose from. Our Secure Status Tag Holder allows you to insert, enclose and contain your status alert tags in a secure tag holder system. These attention getting, all red Secure Status Tag Holder is the secure way to display your tag's message. The status alert tag is placed inside, and a clear plastic face protects and prevents access to and tampering of the status alert tag. Secure Status Tag Holder is designed to fit our standard size tags. Status Alert holder- Our Status Alert Tag Holder's eye catching, red-bordering pocket calls attention to status alert tags warning of hazardous situations. Be certain your status alert tag gets seen with our Status Alert Holder.